Improper installation and routing of hose assemblies is one of the major causes of premature hose failure. 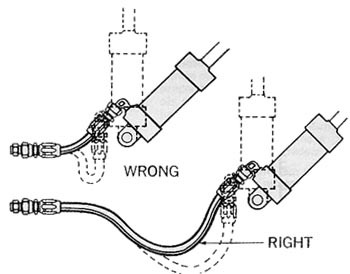 Below is a guide to best practice when installing and routing hydraulic hose assemblies. When pressurised, a flexible hose assembly can change length by as much as +3% or -6% compared to its original length. Always provide some slack in the hose to allow for this shortening or elongation however, excessive slack in hose lines may cause poor appearance. If a hose is installed with a twist in it, operating pressure will try to force it straight. This can loosen the end fitting nut or cause reinforcement separation which can result in hose failure at the point of greatest stress. The printed layline on the hose is a good indication of this. If twisted and the assembly includes a swivel nut end fitting, loosen the swivel nut, untwist the hose, and retighten the nut. 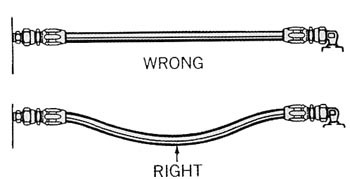 An assembly with two elbow end fittings will twist if the end fittings are not in proper relationship to each other. Exposure to high external ambient temperatures can dramatically shorten hose life. Always route hose assemblies away from heat sources or install a protective sleeve or baffle plate. Constant abrasion at the same point on a hose can wear through the outer cover and eventually weaken the reinforcement. Hose assemblies should be routed to avoid abrasion with sharp objects, moving parts or other hose assemblies. The use of hose clamps can help to prevent abrasion. 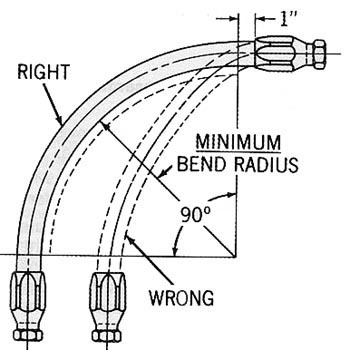 At bends, always provide sufficient hose so that it does not have a bend radius less than its recommended minimum bend radius. Allow at least 1" (25mm) of straight hose out of the fitting socket before it starts to bend. 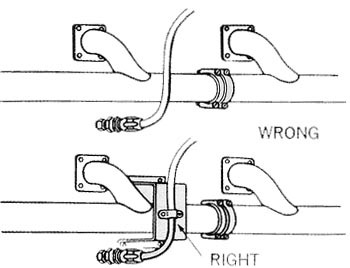 Too tight a bend may kink the hose and restrict or stop the fluid flow. It also creates unnecessary stress on both the hose and end fittings which can lead to reduced hose life. In many cases proper use of adaptors and hose fittings can eliminate tight bends or kinks. In applications where there is considerable vibration or flexing, allow additional hose length. The metal hose fittings, of course, are not flexible, and proper installation protects metal parts from undue stress, and avoids kinks in the hose. 4. Use hose assemblies of proper length. 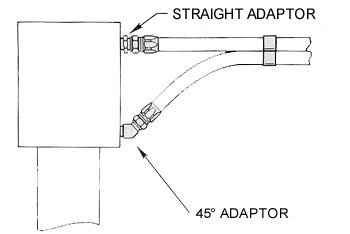 Adaptors have many purposes when installing hose assemblies. 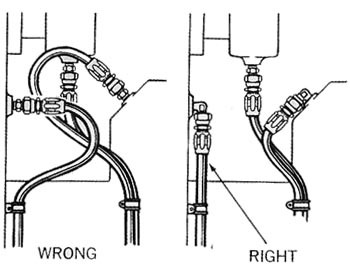 These include joining hoses to a component, connecting two or more hoses together and changing the size or thread of a connection. They come in many configurations and when used effectively, can help tidy up an assembly, increase accessibility, reduce bends and general extend the hose life.